Or should I say "impossible to find toddler bedding." Now that other projects are coming to an end (Nadia's circus party for instance) and others are under way (stay tuned for a post on Genevieve's dresser), I'm finally ready to get back to Genevieve's "big girl room." My goodness, I've been working on this on and off for some time. And I'd love to mark it as complete. 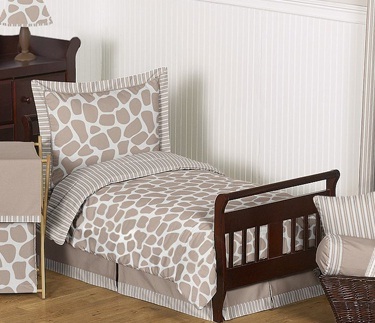 Besides finishing her dresser, the next step in her room is to get her out of her crib! She climbs out if it almost on a daily basis (and will say to me "go stand over there and watch me." as she climbs out or climbs in--landing head first of course). I'm just waiting for her to land wrong and hurt herself It's an awful feeling! But I guess not awful enough for me to grab her toddler bed out of the garage and make the transition I mean, am I supposed to let her sleep on it without cute bedding? What, am I an animal or something? ;) I asked my husband about it the other night and he says, "well I guess we should do it soon--maybe you can go with her and pick out fun bedding..." All I heard was "blah blah blah maybe you can decorate her entire room with Disney characters" and I started to hyperventilate I figured I better get some cute bedding fast before daddy intervenes. So of course I started researching. I should give you a tiny bit of background--I initially figured I'd skip the toddler bed phase. Why spend the money on something she's only going to use a short time? A twin bed close to the ground would be fine. 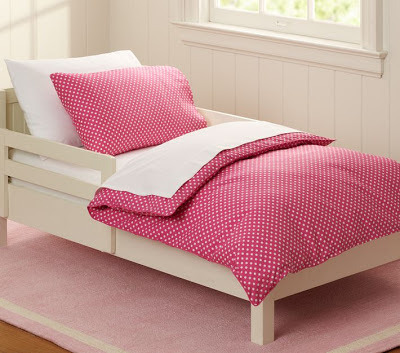 I then found this adorable twin bed on craigslist. But then Nadia happened. I had zero time to paint her twin bed while designing Nadia's nursery. At the same time, my mother-in-law's co-worker gave her a barely used toddler bed that would work just fine. It's not nearly as pretty as the curvy number but it's white, real wood, and has nice clean lines. I may even be able to get away with painting it (still contemplating that one). And the more I thought about it, the more I thought it would be really great to have more floor space for playing. 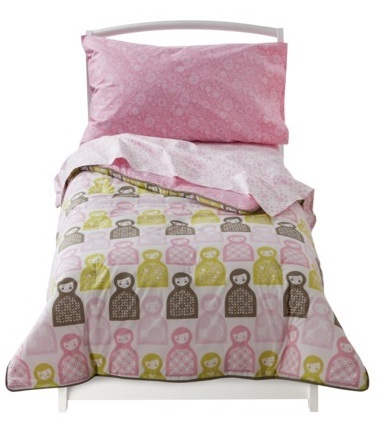 I'm definitely hanging onto that bed (is it wrong to assume our next house will have bigger bedrooms or a playroom?) but for now, the toddler bed reigns supreme. Back to that bedding. 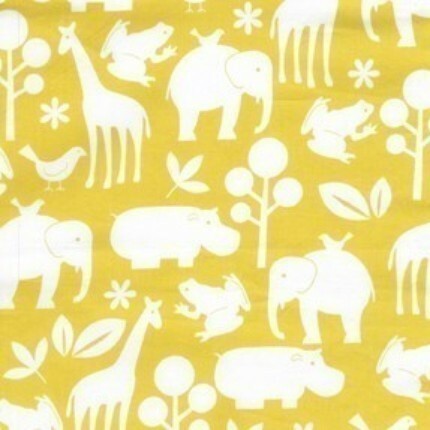 I'm looking for something yellow (or a vibrant pink) and modern. Is that so difficult to ask? I LOVE the Michael Miller zoology print in yellow (my inspiration room used this fabric) but alas it is sold out everywhere. And I can't find anything close to it that I like. However, here are a few sets I did find. 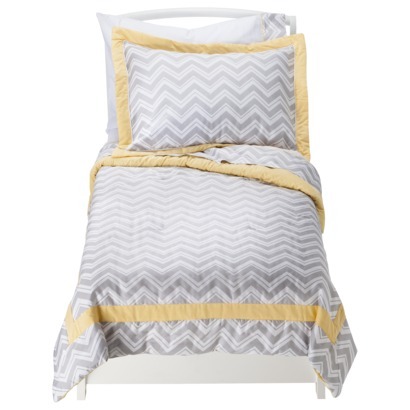 Not all of them go with my color scheme but they are all cute and modern and might help someone else out. These are all either girly or gender neutral by the way. Dolls 4pc Toddler Bedding Set by Room 365. Adorable and on sale! 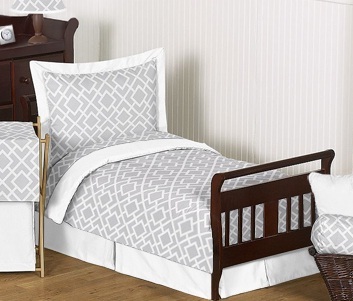 Gray and White Diamond Toddler Bedding 5pc Set by JoJO Designs. SO modern and cool! This one would look great in a boy's room! 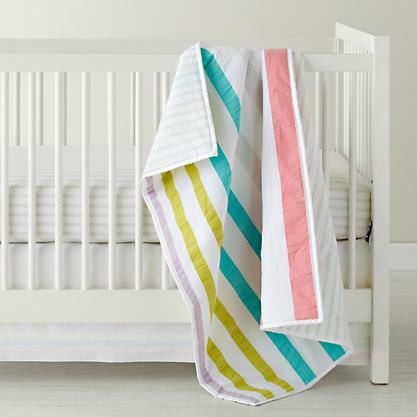 Sherbet Stripes Crib Bedding. Very simple but I love that quilt. 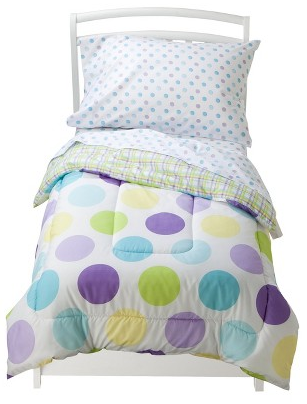 Aqua Dandelion Toddler Bedding. A little pricey for me...and of course the one I like the most! I have a thing for dandelions lately (remember Nadia's dedication brunch)? 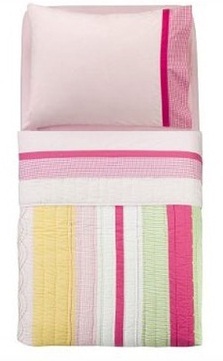 Bacati Girls Stripes and Plaids Toddler Bedding Collection. I don't love quilts but this one is modern enough to tempt me. 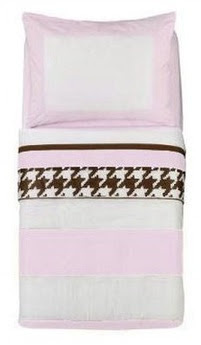 Bacati Metro Pink, White and Chocolate Toddler Bedding Collection. I have always LOVED houndstooth. (rewind to 2nd grade when I wore my houndstooth bubble skirt like every day). Mini Dot Toddler Duvet Cover. Simple and clean. Could jazz up with fun throw pillows. This one is a front runner. The search continues...and I just may make my own...What are you searching for?